So, a year ago today, I decided to post for the first time on this little slice of the Internet I'd claimed for my own (several months before I actually posted-but do us both a favor and don't worry about going back that far). It may be a little cliché to say "Hey guys, today's my 'blog-iversary' and here's a cupcake and you should celebrate with me!" 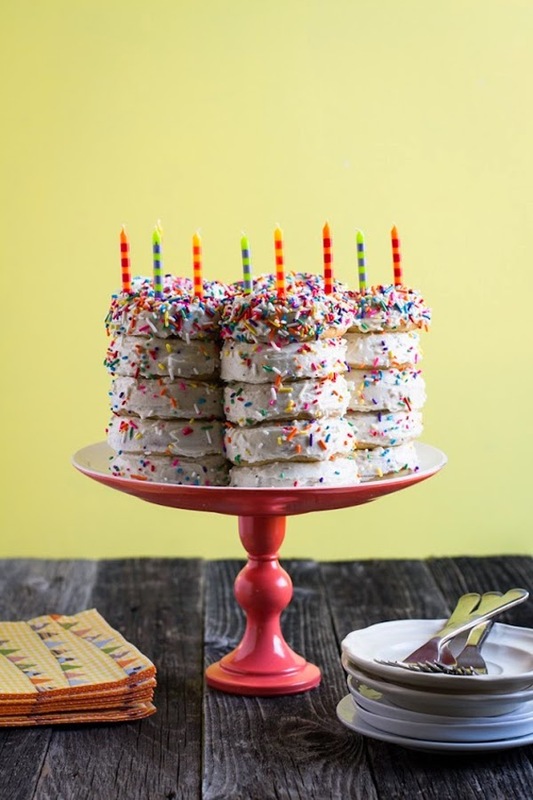 but that's why I chose a donut cake instead (clearly more awesome). You don't have to celebrate with me, but if you end up eating an extra donut (or cupcake/cookie/cake/sweets etc.) at least I'm giving you a pretty great reason. On a more serious note, this has been a wonderful journey, adventure and learning experience. I've made some great connections and incredible friends. I don't know where I'll be-in life or with this blog-a year from now, but I hope that wherever I am I've grown at least half as much as I have this past year. Lastly, thanks to YOU for coming here, whether it's your first visit or you drop by daily-I may post for myself, but it's the readers who keep me inspired! Happy blogiversary, Rose! Cheers to another year.